A new genetic testing service is opening at Belfast City Hospital aimed at identifying and supporting those at risk of heart problems. 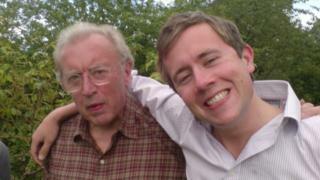 It is the first service in the UK to benefit from a fund set up in memory of the late broadcaster, David Frost. It is estimated more than 17,000 people in Northern Ireland are living with a faulty gene putting them at high risk of sudden death or heart attack. The cash will provide an extra nurse for a specialised unit at the hospital. Mr Frost's son, Miles Frost, died from a heart condition called hypertrophic cardiomyopathy (HCM) aged just 31. Although Sir David did not die from HCM, his post mortem found the disease was present. Miles and his brothers, Wilf and George, were not tested for HCM before his death. Dr Alison Muir, consultant cardiologist at Belfast City Hospital, said: "In Northern Ireland, HCM affects approximately 1 in 500 individuals, but if you imagine that we have to see their parents, siblings and children, that's a lot of people. "Our new nurse will help us see a lot more patients each year. "When someone dies from an inherited heart condition not only will their family be faced with the devastating loss of a loved one, they will also face the possibility that they or another family member could be affected with the condition. "It is important they are referred to the service so we can carry out this cascade testing. "It can be a frightening prospect so the care of a specialist inherited cardiac conditions nurse is vital to support them through the process."